and Janay will be dressed as Shriners! Hello, this is Erin Burnett and this is CNN. We're delighted to announce that effective immediately and for the forseeable future CNN is going to ALL RAY RICE/ALL THE TIME COVERAGE! Consider CNN your one-stop shop for all the news about Mr. Rice and the fabled pummeling and dragging of his comatose soon-to-be wife Janay Palmer out of an elevator at the Revel Casino in Atlantic City. If it's about Ray Rice, it will be here, it will be up-to-the minute, and it will be sensationalized as much as humanly possible! Our pledge to you: there will never be any annoying interference with our 24/7 Ray Rice coverage by other news, even if it's important. You can count on it! With CNN's new ALL RAY RICE/ALL THE TIME COVERAGE!, you'll get more than just surface headlines about Ray Rice. You get 3-D enhanced versions of the pummeling and dragging elevator videos presented from a wide variety of angles including that of a rodent who might be lurking about the ceiling of the elevator! You'll also experience the elevator videos as reenacted by an array of Hollywood's most talented actors and also by Hollywood's most untalented actors, including Nicholas Cage and Hayden Christiansen from the unnecessary fifth and sixth Stars Wars movies. And we'll examine the Ray Rice videos against videos of people in elevators who are not pummeling or dragging anyone, with insightful analysis as to the differences between them by our own legal expert Jeffrey Toobin. And now you can order Ray Rice products and memorabilia, direct from CNN! Here's the official "I survived the Elevator at Revel Casino" Ray Rice Sweatshirt in gray, blue, and blood red, refrigerator magnets with the words "Not stickin' with Rice," and the Ray Rice and Janay Palmer Rock'em Sock'em Robots! CNN operators are standing by. CNN has long been recognized --- over the past day and a half --- for the best coverage anywhere of the Ray Rice saga. And we will continue in that proud tradition by providing you with insightful opinion and commentary into the motivations behind Ray Rice's pummeling and dragging presented by our panel of distinguished experts: the minimally qualified Dr. Phil McGraw, opportunistic weasel Dr.Drew Pinsky, and of course, Oprah. Welcome to ALL RAY RICE/ALL THE TIME COVERAGE. Trust us, nothing else is really happening in the world until we tell you it is! I hope Direct TV doesn't charge me an arm & leg (unless its Ray Rice's arm & leg) to add this channel to my subscription. I can't wait to pop a big bowl of popcorn and settle in next to Connie for an evening of grainy black & white domestic violence. That's the best comment I've gotten on this post yet, Russell. Hey, I'll come over with my "I Survived the Elevator at Revel" T-Shirt and watch with you guys! Gee Perry, this is great - you are so witty and informative! 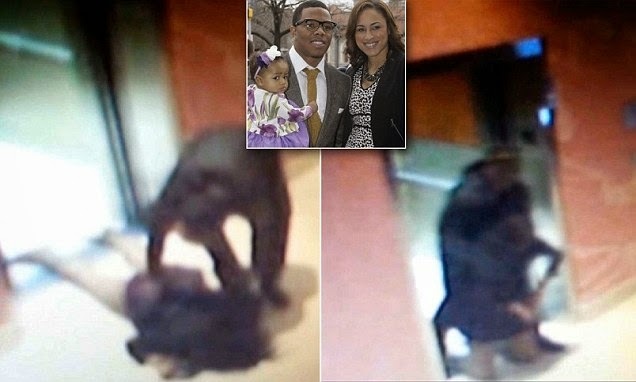 How exciting to have a complete 24 hour news channel solely dedicated to an ape football player pummeling his beautiful fiance because she dared speak her own mind - which of course, the NFL frowns upon but ignores in public! This is perfect television for all ostrich audiences that don't give a flip what else is happening. Excellent Perry! Thanks, Nan! This one didn't come out quite as well as I hoped, but it makes the point. Right now there are fascinating reports all afternoon on CNN about how Ray Rice showed up at a high school football game at his old high school. I wonder what snacks he might have bought from the vending machines there?